DJ sets: Andrew Weatherall b22 Daniel Avery / Awesome Tapes from Africa / Ben Klock b2b Marcel Dettman / Elijah & Skilliam / Floating Points / Huw Stephens / John Talabot / Leon Vynehall / Madlib / Marc Riley / Nina Kraviz / Phil Taggart / Tom Ravenscroft Volte-Face... and much more TBA. Field Day are thrilled to welcome the hotly tipped TÃLÃ for her first ever festival appearance, in a London exclusive, to Field Day 2015. The super talented London based producer/singer/songwriter will bring her mix of Middle Eastern tradition, sultry R&B and atmospheric industrialism to Victoria Park this summer. Also on board this year is LA Priest, the glorious project from reclusive electronic musician Sam Dust of critically acclaimed Late Of The Pier, who's anticipated new single 'Oino' will be released on Domino this week. Meanwhile, Heavenly-signed Hooton Tennis Club, with their effortless languid lo-fi in the classic Teenage Fanclub and Pavement tradition, have also been added to the Field Day Saturday line up. 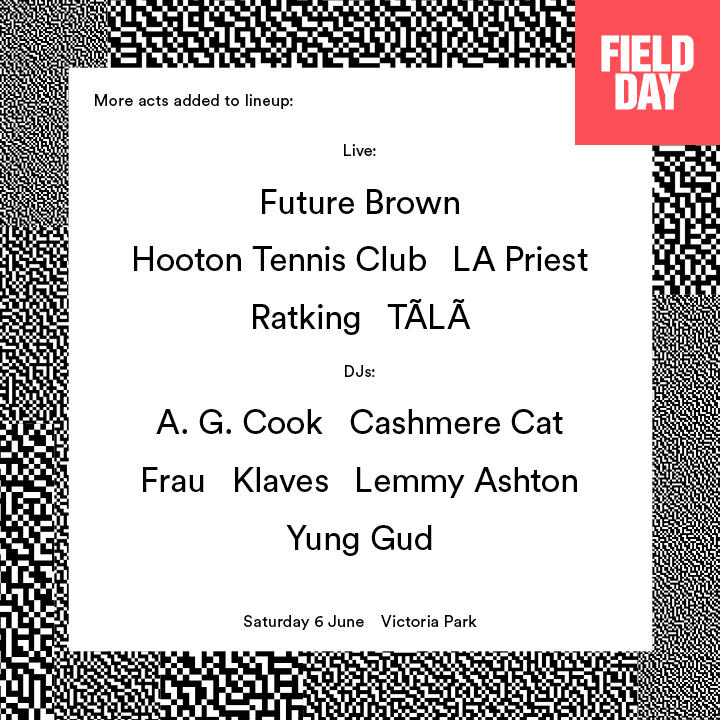 Field Day are very pleased to announce that i-D Magazine will be hosting a stage at Field Day on Saturday 6th June. The excellent line up includes the brilliant Oslo based disco and house producer Cashmere Cat, PC Music founder and producer A. G. Cook, adventurous New York hip-hop trio Ratking, global electronic collective Future Brown, Rinse FM residents Elijah & Skilliam, purveyors of complex synths work and warm sounds Honne, as well as Swedish beatmaker Yung Gud with more to be announced very soon! Field Day are thrilled to announce new sensational DJ additions to their Saturday line up. Joining the likes of Nina Kraviz, Madlib, Ben Klock and Marcel Dettman are young polish prodigy producer Klaves, London's busiest resident Lemmy Ashton, as well as Frau DJs, the all-female DJ collective. RIDE / Patti Smith and her band perform Horses (1975-2015) / Mac DeMarco / DIIV / Eagulls Errors / Beyond the Wizard's Sleeve / Savages / Hookworms / Gaz Coombes / Viet Cong / Baxter Dury / Allah-Las / Ex Hex / Ducktails / Outfit/ Hælos / Jane Weaver / Pane / My Brightest Diamond / Bad Breeding / Gulf / Cairobi / Heavenly Jukebox / Justin Robertson... and more TBA. 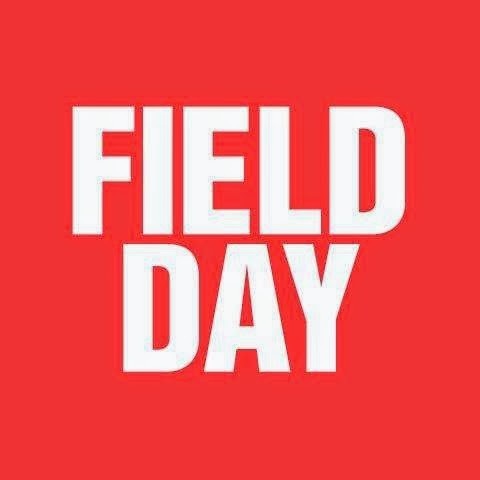 Field Day are thrilled to announce more exciting additions to the Field Day Sunday line up, which so far includes newly reformed seminal shoe-gazers RIDE as headliners, as well as the iconic Patti Smith & her band (performing her 1975 groundbreaking album Horses), Savages, Mac DeMarco, Gaz Coombes, Hookworms and many more. Signed to Mogwai's Rock Action Records, Glasgow's Errors expertly meld electronica and live elements to create a unique sound that has won them fans from all corners. The first listens of their new album 'Lease of Life' is a masterpiece, ably demonstrating a band at their best. A force to be reckoned with live, Field Day can't wait to have them at their Festival this year! Also confirmed for the Sunday are psychedelic-pop outfit Cairobi who will bring their shiny, colourful, rhythmically complex and elusively distorted sounds to Victoria Park this summer. 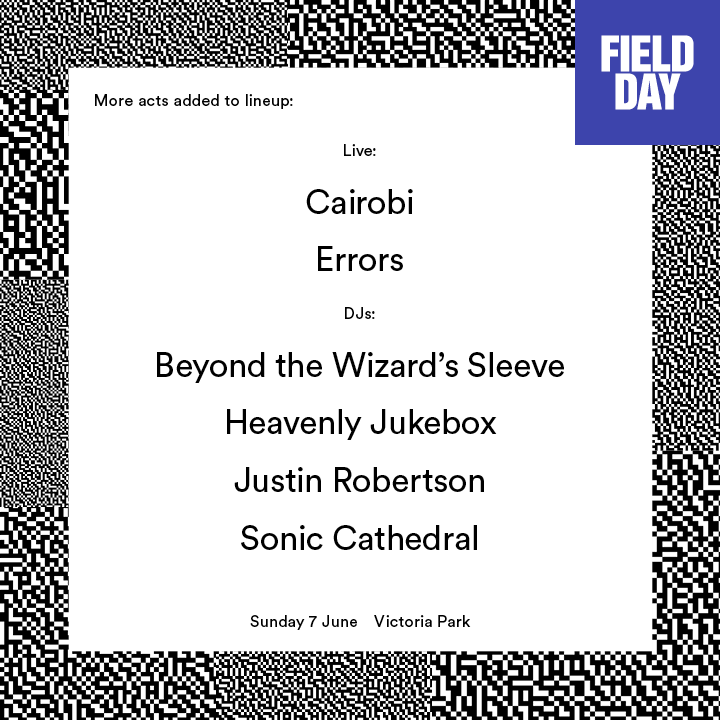 Field Day are very excited to announce new outstanding DJ additions to the Field Day Sunday line up including Beyond the Wizard's Sleeve the warped-Balearic-psychedelic brotherhood of Erol Alkan and The Grid's Richard Norris; club night heroes Sonic Cathedral the label in charge of releasing a wealth of records from the likes of Young Husbands, Specres, Vacant Lots...; Heavenly Recordings DJ arm Heavenly Jukebox, who've been soundtracking parties and festivals since 1990; as well as the ever-present and hugely influential artist DJ, producer, label owner and master remixer (Björk, Happy Mondays etc) Justin Robertson!